I had read parts of the Metamorphoses in high school, and my focus then was on the language and structure of the text, not so much on the stories. That’s just what happens when you’re trying to learn how to translate texts from Latin. When I picked up the book again earlier this year, I had no such restrictions (and no deadline) and I was looking forward to reading Ovid’s history of the world – from its creation to Julius Caesar. What I was looking forward to even more, was to read about the myths and legends that have informed so many other works from Dante to our own contemporaries like Ali Smith, and find out more about Ovid’s view of the world in 8 AD. Yes, Ovid’s view. The Metamorphoses may be a collection of ancient Greek and Roman myths, but there is a slant to them that is influenced by Ovid’s view. 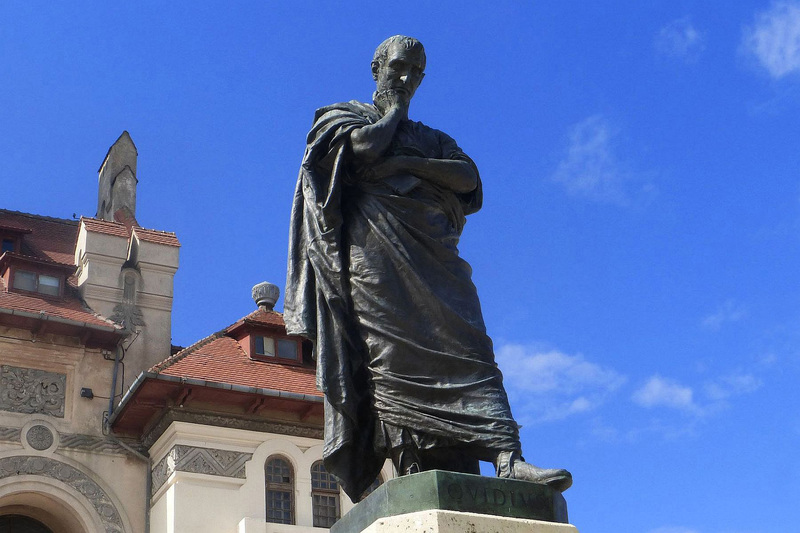 Some of the myths differ from the earlier versions found in the works of Hesiod and Homer, and then there are stories about Julius Caesar and Pythagoras that are not based on ancient myths but are informed by Ovid’s time. 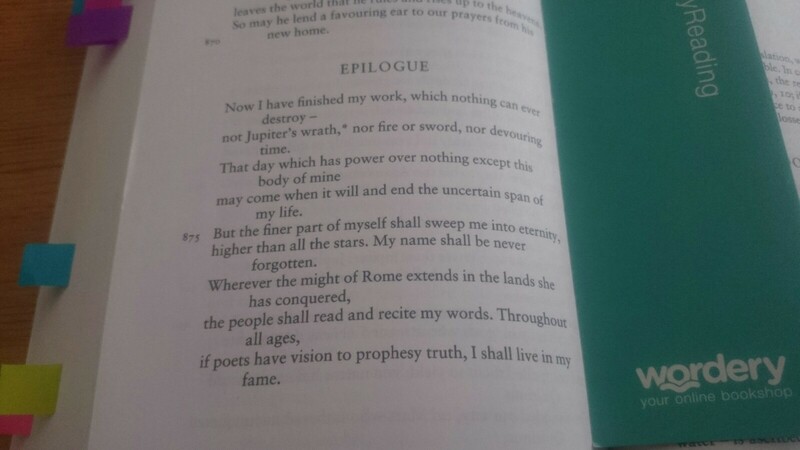 The book, or rather the last book of the 15 books of poems that make of the Metamorphoses, ends with Ovid praising Augustus. Incidentally, it was Augustus who banished Ovid from Rome at about the same time that the book was finished – the reason for this remains one of the unsolved mysteries of history. Anyway, more about the book: The book starts with the creation of the world and tells of how the world was transformed by the elements and by man, going through different ages, and finally focusing on the stories of gods and men and the many transformations that take place when they interacts. Transformation, as the title says, is the theme of the book: some are literal when people are transformed into plants or animals, some are less tangible, for example when Medea loses herself to witchcraft, and finally the philosophical theories that Ovid describes in the story about Pythagoras, who believes in a continuous and fluid world in which everything is temporary, and in which everything is in a state that changes into something else, and in which existence is thus infinite. It’s very zen for a 2000 year old book (that is not a major religious text) right? This probably is what surprised me most about the book: how many times I caught myself being astounded to read about concepts that seem a lot more modern. Medea and mental illness, for example. Ovid does not tell the full story (and yes I will dig out Euripides’ work to find out what drove her over the edge!) but by his leaving out such detail, I can’t but marvel about what Ovid’s audience would have made of it. Would they also have wondered about what caused her breakdown? Or, the stories of individuals struggling against higher powers, fate, or society. Ancient gods were assholes. Not many of the stories have happy endings, and in some, even happy-ish endings are pretty sad. However, all of them have a message, which is why Ovid selected them, and which is why so many of the stories have permeated Western culture. Even if they now only exist by reference to a name and most people won’t know the story behind the reference. My favourite of those, probably is the story of Arachne. I’m not a fan of spiders, and I had imagined all sorts of variations of a horrible monster to be the origin of all spider-related words. But no. Arachne was a master waver who dared to enter into a weaving contest with Athena. Long story short, in Ovid’s version, Arachne dared to show how unfair the gods and goddesses are and she dared to defeat Athena. Athena throws a fit of rage and destroys Arachne’s tapestry. Arachne hangs herself in a fit of rage. (Yeah, I don’t get this part – revenge suicide???) Athena, again, out of rage over Arachne’s suicide turns her and her into a spider. Now, this is not the most logical of stories, granted, but I love that the story’s metaphorical content is still applicable. I won’t be able to look at spiders with quite the same level of aversion again. Well, some of them at least. Most will still freak me out. So, yes, this book took me a few months to finish, but it was a lot to digest. A lot of stories that required some thought, a lot that just needed a break before getting to the next one. It was an amazing book. After 2000 years, this is still entertaining, thought provoking, and beautiful. Ovid does still live in his fame, and for all the right reasons. Lastly, a word on the Penguin 2004 edition with David Raeburn’s translation: It rocks. There are plenty of free or cheap translations available on the internet. I tried a few of them, but none really worked. I found those translations to be either too literal or too liberal. Raeburn’s work combines a great balance of keeping close to the original text while still creating a work of poetry, and even keeping the original rhyme scheme. Previous Previous post: Reading progress update: I’ve read 598 out of 723 pages. I’m with you on how amazing and modern it is – mind-blowing, the way it pulls the universe, history, characters apart and shines clarity. Have you come across Ted Hughes version? Hi. I have come across the Ted Hughes version, but I am not a fan of it. I get what he was doing, but I could not get interested in it. I’ll check out the David Raeburn one then – I only know the Hughes – I love his visceral uncompromising words, like a dagger separating bone from muscle and teasing out the soul threads. Raeburn is a true translation of the whole book. Hughes selected a few verses and brought them into the 20th century – Ovid was a visionary, but he could not have written about missiles. And then, of course, Hughes lathered the lot with his own perspective. The Hughes version (Tales from Ovid) is a work by Hughes very loosely inspired by Ovid. I totally recommend the Raeburn. It was a joy to read. A question I haven’t been able to answer is: did Shakespeare know of Dante? This seems to me one of the literary mysteries of Shakespeare’s age which I have not been able to find much comment on. Ah, but as intriguing as it would be to find out what Shakespeare read, I fear it might take away some of the awesomeness of his works to find out that any particular story or stories might have influenced him. Its influence on Shakespeare is enormous. Great review. Like everyone, I wanted to know so much more about Shakespeare as a person and the exploration of what he read, namely Ovid, makes so much sense. Off to read Ovid! Enjoy! I hope you have as much fun with it as I did.